Experience an added convenience this summer on the Eastern Market – L’Enfant Plaza route. The new route provides access to Nationals Stadium via M St. & Half St. SE. Service hours on this route extend until midnight for all Washington Nationals home games beginning 6 pm or later, Monday through Saturday. For Sunday home games, this route runs 11 am to 9 pm. Connect to Orange, Blue and Silver lines at the top of the escalators at Eastern Market Metrorail Station (Pennsylvania Ave. & 8th St. SE). Or catch the Congress Heights – Union Station Circulator bus to connect to the Red line, Marc Train and VRE. (CHUS Circulator route does not run extended hours on game day). This route is the perfect option to avoid game day crowds on Green Line trains and to connect to L’Enfant Plaza with ease. 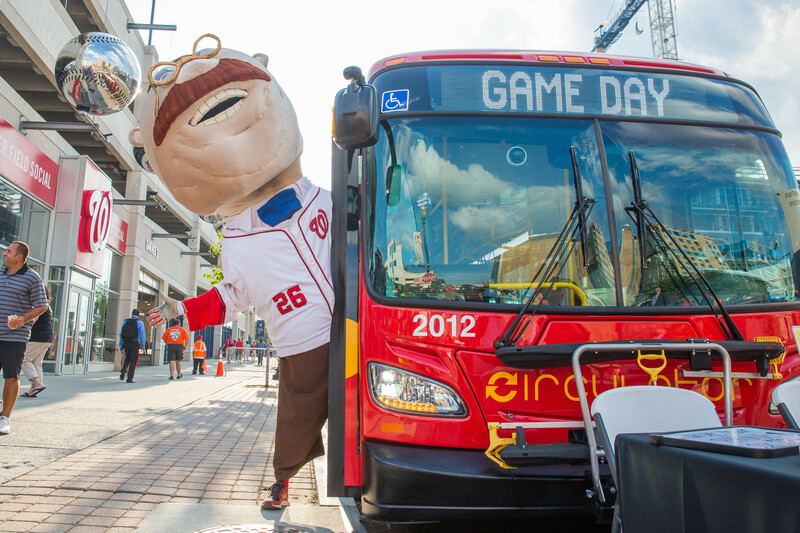 DC Circulator reserves the right to make any necessary service adjustments based on any changes to the Washington Nationals’ game schedule. All service announcements will be posted on the DC Circulator website and Twitter. Looking for something fun to do before or after the game? Check out the Capital Riverfront Business Improvement District for updates on local events and attractions.